I have crazy combination skin that is also super sensitive so finding skincare products that work for me has always been a bit difficult. Usually, a product will work great for the first couple of days and then, out of nowhere, my skin will start freaking out. I’m talking massive breakouts, dry patches, the works. It hasn’t stopped me from trying new products, but it definitely keeps me from ever calling something a holy grail product. Each of the products I currently use have been in my rotation for almost a year now and I couldn’t imagine giving any of them up. I always start my routine with the Liz Earle Cleanse & Polish. It’s a great everyday exfoliant that doesn’t strip your skin or leave it super dry. It also smells awesome, very herbal and soothing. I love that using the muslin cloth means I don’t have to splash water on my face. Afterwards, in lieu of a toner, I spray some Evian mineral water all over my face. It’s a quick wake up for a sleepy morning. I dap on a bit of Algenist Eye Renewal Balm, the only eye cream I’ve found that actually lightens my dark circles. Finishing up my morning routine, I moisturize with Fresh Lotus Youth Preserve face cream. It gives the perfect amount of moisture without feeling overly greasy. Masks are a complete essential in my skincare routine. When my face is having a breakout freakout, I always use the PTR Pumpkin Enzyme Mask. The big tub lasts you such a long time, it has an amazing pumpkin smell that is perfect for this time of year and it does an amazing job of declogging and cleaning up my skin. I always notice a difference the next morning. With winter coming up, I know I’ll be needing a super moisturizing mask to make up for the cold dry weather. For that, I always go for Origins Drink Up Intensive Overnight Mask. It banishes dry patches, smells wonderful and doesn’t make you feel like your’e caking anything on. 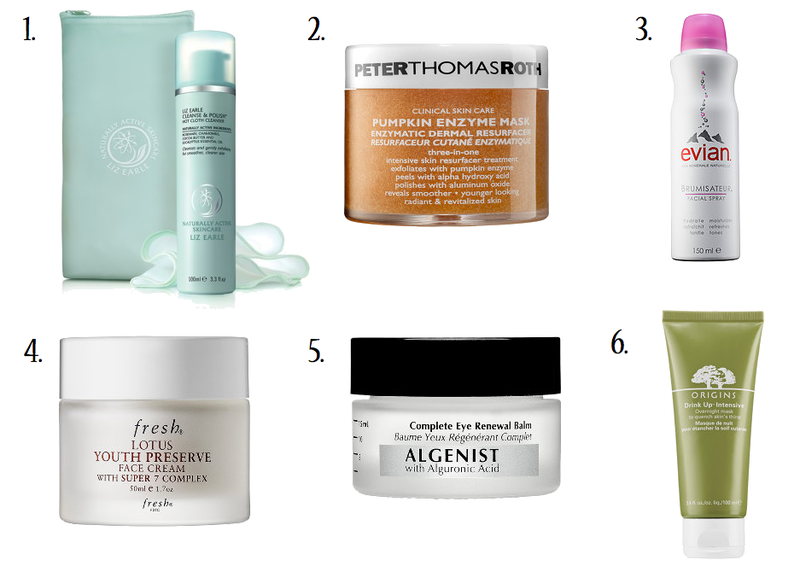 Have a skincare product favorite? Share with me in the comments below! I will have to try that pumpkin mask.. sounds awesome! I also have really sensitive skin. Thanks for the post! I'm definitely going to try these! I am obsessed with Blue Mercury's M-61 Glow Peel Pads. They transform my skin in 5-minutes. I am currently loving all my skincare products in my Birchbox October box which is name Game Face filled with Estee Lauder family of products!!! My face feels so much better and I can't wait doing eye makeup next week! I use the same under eye stuff in the morning – life saver! That pumpkin mask is on my to buy list! I love the Evian water as well — one of my favorite facial mists. I love this round up — you've got some great products!